Data from 2016 are now included to give a wider view of the “before” conditions on King Street. The method of highlighting events affecting travel times has been changed to improve clarity. The three TIFF periods are shown by red bands in early September each year. The period of construction on Queen at McCaul in fall 2017 is shown by an amber band. The period of construction on King at Charlotte in spring 2016 is shown by a purple band. The beginning of pilot operation in November 2017 is shown by a green band. The first week of restored transit signal priority (TSP) in July 2018 is shown by a blue band. These are not the only events affecting service, but they are the longest-lasting. Click to open and expand the view of any chart below. 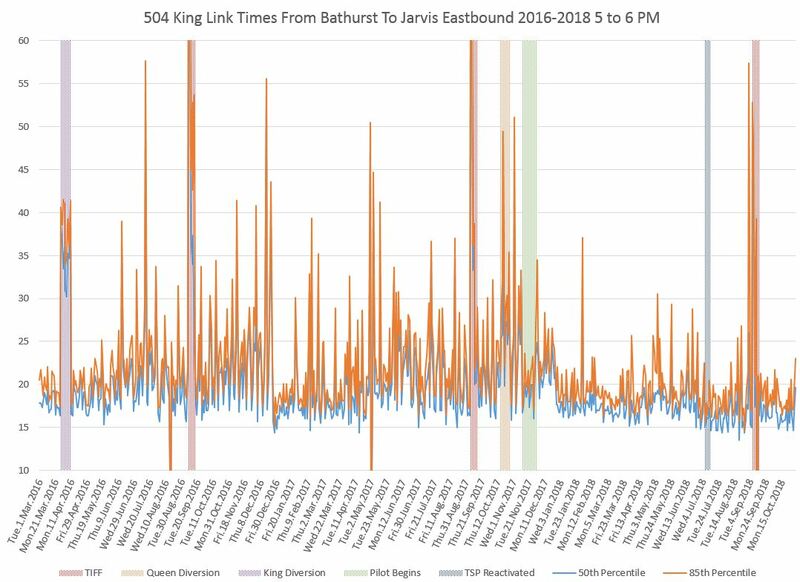 The eastbound travel times behave similarly to westbound. In both directions there are marked changes with the pilot. The median value (blue) of the travel time (50th percentile at which half of the trips are longer, have shorter) remains fairly consistent even during traditionally busy summer periods. The 85th percentile (amber) is much less “spiky” once the pilot begins compared to previous years. The travel time seen on most trips remains in a narrow band most of the time. The reactivation of TSP produced a small improvement of 1-2 minutes depending on the time of day, but the important issue here is that TSP had been turned off when the pilot started. Therefore a true “apples-to-apples” comparison is between the pre-pilot levels and the values after July 2018. Some criticism of the pilot turned on the small time savings, especially in the AM peak, and it turns out that this saving would have been better if signal priority had remained active. 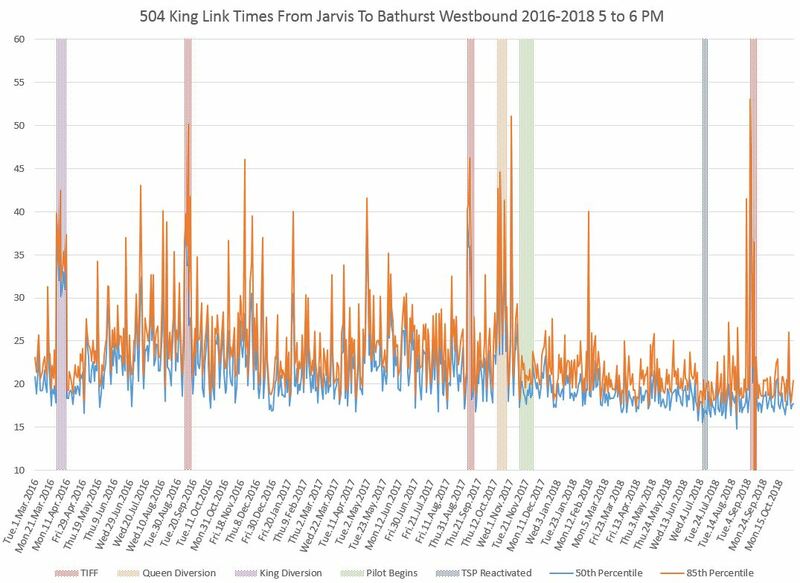 The important comparison is the reliability of the travel time (and as we will see later, of headways) so that riders have a low chance of hitting “one of those bad days” very often, and when they do, it’s probably not as bad as in the pre-pilot era. Comparisons that only look at the average change in travel time miss this important point. The “before” data (referred to as “baseline”) covers only the periods of September and October 2017 that were not affected by TIFF nor by the construction at Queen & McCaul and associated 501 Queen service diversion. The charts presented here go back to early 2016 showing the route’s behaviour through various seasons and events. The City charts treat the AM and PM peaks as a three hour window and consolidate data over that period for entire months discarding the outlying 5% of values at the top and bottom of the range. This shows the overall effect, but masks the change in the character of the data from hour to hour and day to day. When the three-hour PM peak is consolidated, the chart changes slightly from the one shown above. With the inclusion of the 4-5 and 6-7 pm data, the values are slightly lower because travel times in the shoulder peak hours are better than from 5-6 pm. In particular, note the “shaving” of the peaks in the consolidated three-hours because there are many more data points closer to the median in the shoulder hours and the 85th percentiles for the longer period are therefore not as high. For riders during the peak hour, the degree of improvement is better than the three-hour figures imply. The effect in the AM peak is not as marked because the “before” service did not face the same conditions as in other parts of the day. In the evening, congestion in the Entertainment District is subject to effects such as weather, but most noticeably by the day of the week. The data from 10-11 pm show a regular pattern corresponding to the busy late-week days Thursday and Friday. Another way to look at the data is to plot various percentiles so see how they behave. When this is done for many different values, the result is a very busy chart that hides as much as it shows. However, picking out specific percentiles shows how the travel times are confined to a smaller range post-implementation. 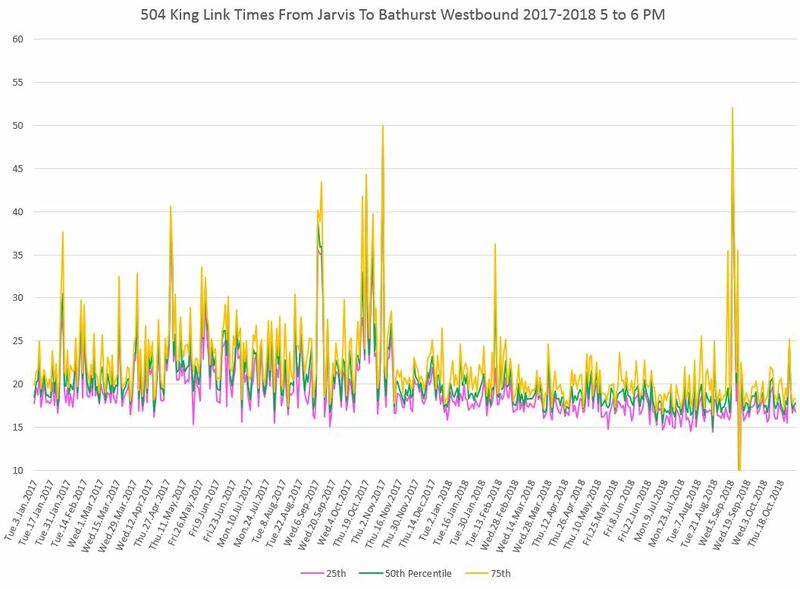 The chart below shows the 25th (pink), 50th or median (green) and 75th (yellow) percentiles for the PM peak hour westbound in 2017-2018. Note how the range of values from mid-November 2017 onward covers a smaller range showing that the headways on half of all trips (25th to 75th percentiles) fell in a narrow band, and this band did not move around much. The next chart expands the reach to the 10th through 90th percentiles, or 80 percent of all trips. The median line in green is the same as above, but the 90th (blue) and 10th (red) lines spread further apart around it. As above, the values are more stable post-implementation than before. Finally, a chart showing the maximum and minimum values which, like the others above, are better behaved post-implementation. 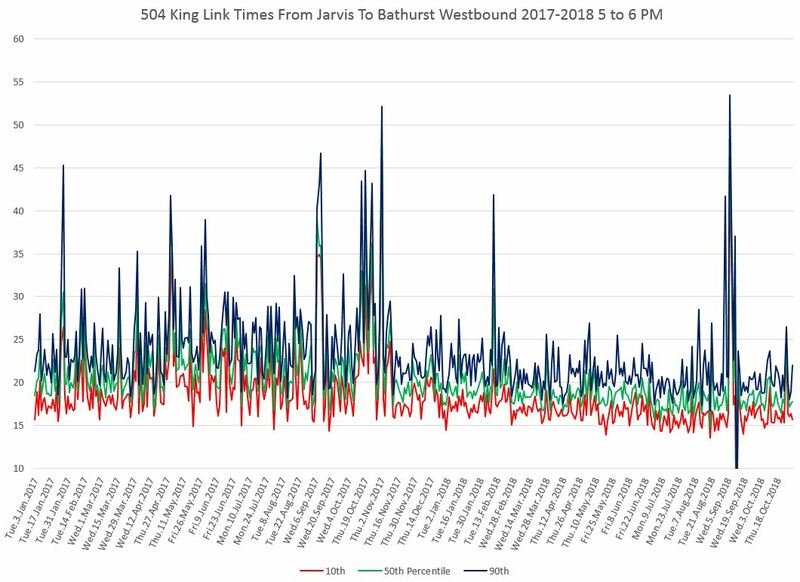 An important issue with the success of the King Street Pilot and with the recent service redesign is the ability of service to handle the demand present on the street. Although the service is more reliable on the central part of the route, there are still problems with would-be riders being unable to board. How this will be addressed by the TTC given their ongoing shortage of vehicles (both streetcars and buses) remains to be seen. The service design for the period when King-Queen-Roncesvalles will be closed for construction in 2019 has not been announced. 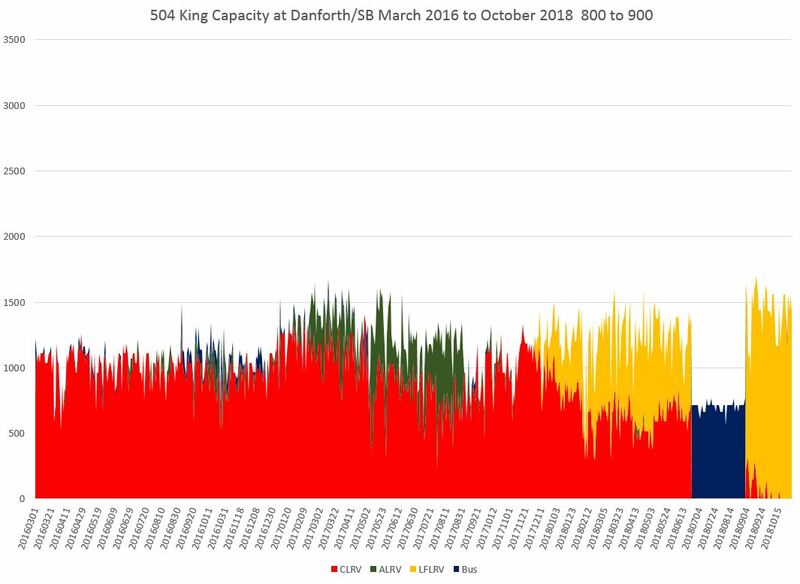 By the time that has completed, the TTC should have received many more new cars and, depending on requirements of other routes, may or may not be able to increase service on King. The next route planned for Flexity conversion is 501 Queen starting in early 2019. 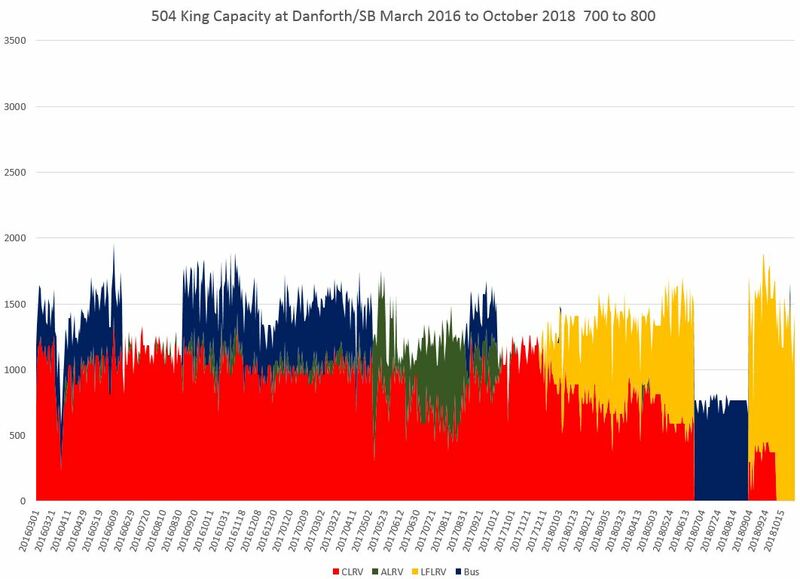 Capacity inbound from Dundas West Station south to Queen has fallen with the new schedule design. However, it was not affected as much by the new schedules as points east of Roncesvalles (see below). The capacity of service eastbound at Jameson between 8 and 9 am has been affected by various changes to the schedules over the years including the operation of bus (blue) and ALRV (green) trippers which come and go depending on vehicle availability. 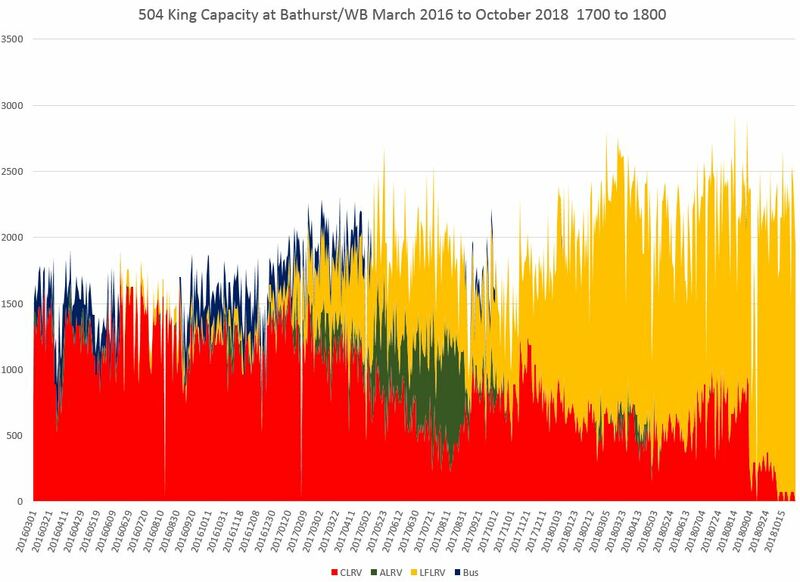 By early 2018, the replacement of old CLRVs (red) with Flexitys (yellow) began a rise in capacity that peaked in late summer. Since then, the capacity operated west of Dufferin has fallen with the new service design that keeps more cars on the central part of the route. The capacity provided at Jameson earlier in 2018 is higher than that at Dundas West (above) because all vehicles did not operate to the terminus. They were either trippers or they were short turned at Sunnyside. The capacity eastbound at Jameson is now roughly the same as that leaving Dundas West. 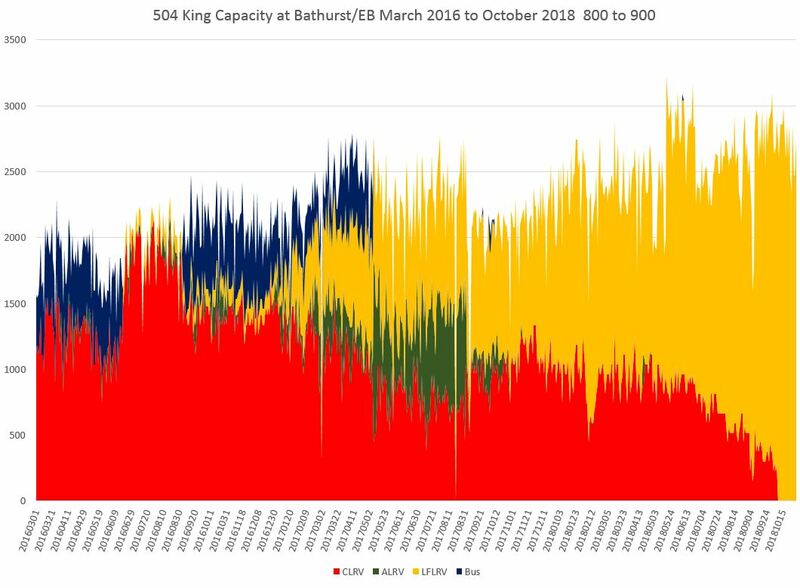 The capacity provided at Bathurst is now roughly double that at Jameson because both the 504A Dundas West/Distillery and 504B Dufferin/Broadview services are here. However, growth in capacity has topped out with the current schedules. Pre-implementation. All cars that will provide service from Broadview WB are in service by 8 am, and some of these are short turned on the trip east from Dundas West. This means that less service reaches Broadview than is scheduled. Post-implementation. 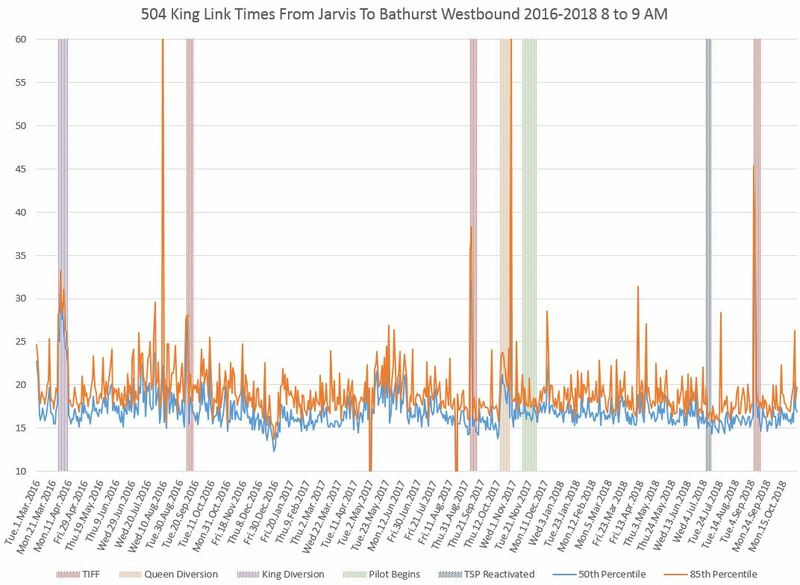 Peak cars are still entering service from Leslie Barns to Broadview Station at 8 am, and service that does come east from Dufferin Loop on 504B gets through without short turns. The result is that “new” service capacity is comparable to “old actual”. In Part II I will review the reliability of this service which, with wider scheduled headways, is not as good as that previously operated. 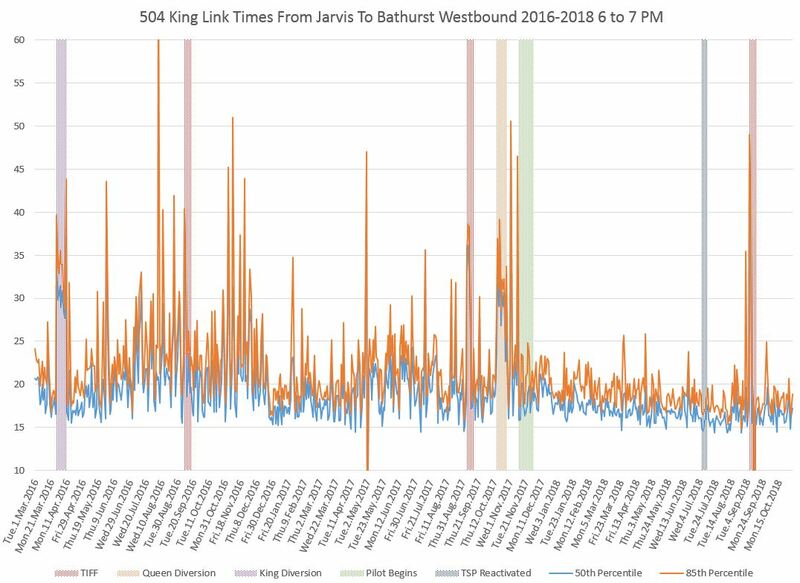 In the chart below, the blue band in mid-2018 corresponds to the bus shuttle operation provided during track construction on Broadview. The decline in scheduled capacity is more evident in the 7-8 AM period when the offsetting effects described above do not apply. 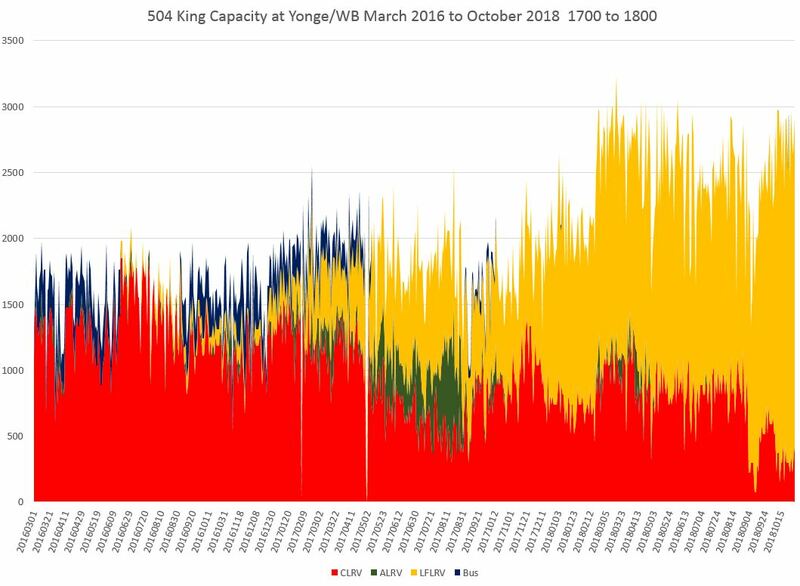 During the PM peak, the capacity westbound at Yonge has been maintained roughly at the same level through 2018 except for the summer. 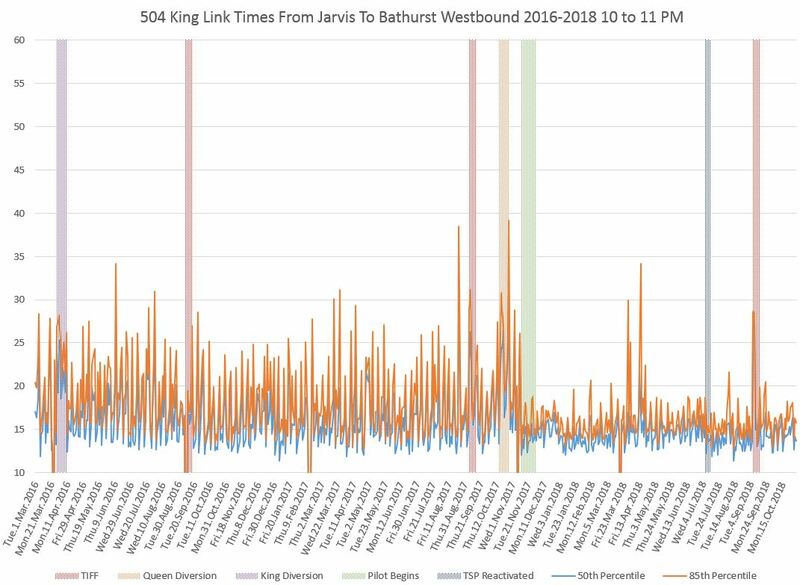 The red band of CLRVs in this chart is, by October 2018, the contribution of 503 Kingston Road Trippers which operate to Charlotte Loop at Spadina as they have done since February 2018 except for a brief period at the beginning of September. All of the 504 King service now operates with Flexitys. Service westbound at Bathurst does not include the 503 Kingston Road Trippers which drop out of the mix at Spadina. 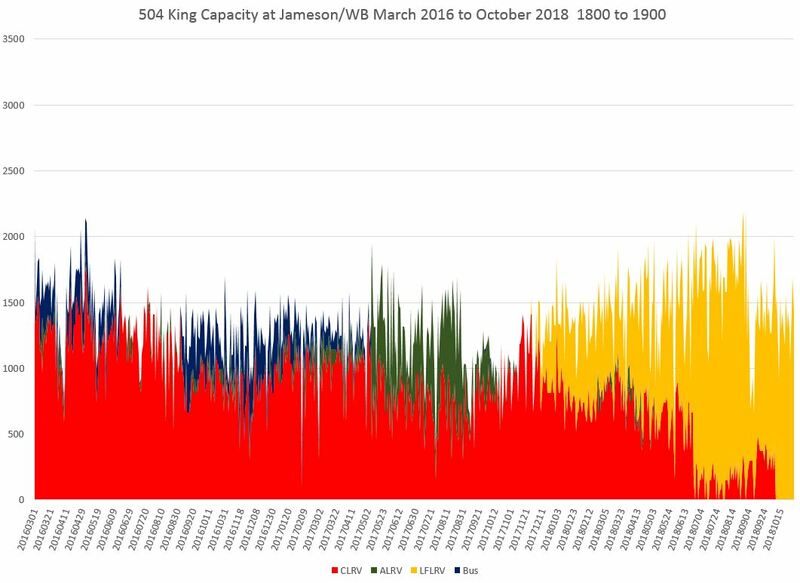 Capacity has been at a plateau at this location through much of 2018. 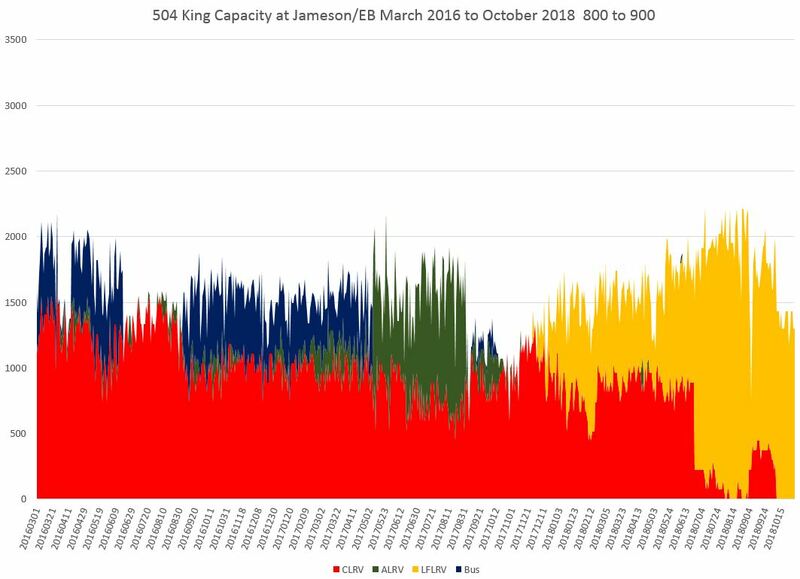 The capacity at Jameson has fallen back to late 2017 levels and is only sustained at this level by all service being operated with the larger Flexitys. 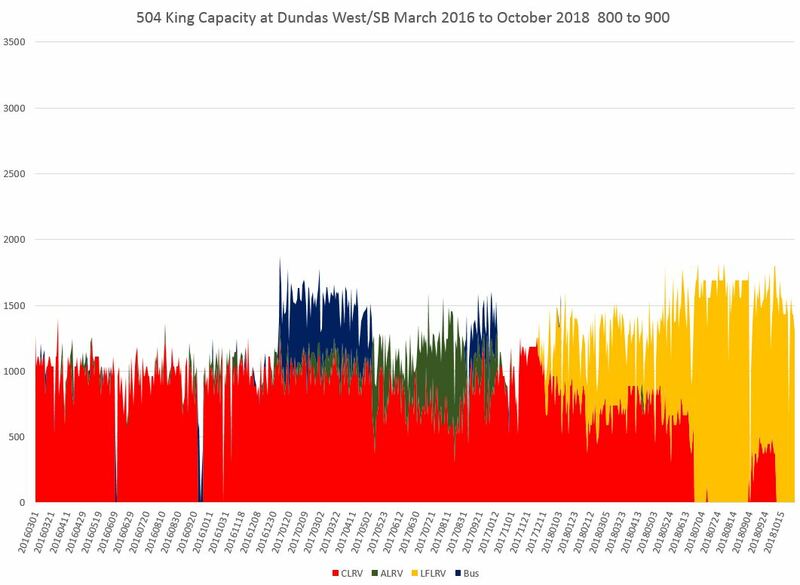 The full sets of capacity charts covering the four hour peak periods are linked here. Can the TTC be relied upon to draw the correct conclusion – reliable service is rewarded with more ridership. The charts show less deviation from the target running time, with a steady narrowing trend from the start of the project. The interesting point (or anomaly) in the data is the September and October 2018 data – lower capacity on the lines and a small upward trend in travel time. I am drawing a conclusion that demand is slowing the service speed. I am assuming that the demand, even with all door boarding, is slowing loading. Hopefully, when all the new cars are available, the TTC can add extra cars (trippers or regular service) to see if they can drop the travel time again. Steve: Something that has bothered me through the whole pilot is that the TTC and City continue to cite the travel time change without going as much into service reliability, i.e. less variation in headways. An important component of rider satisfaction is the reduction in wait time which is well known to be perceived as “longer” than in vehicle travel time by riders. The TTC incorporates this into their route design standards giving a higher penalty for long waits. This would be compounded if riders could not board the first vehicle that shows up. As for a loading vs travel time relationship, that is an interesting point worth following, although I want another month or two’s data. The fall brings a rise in demand even without the incentive of the King Pilot. Tracking stop dwell times is tricky with the available data because of the 20 second polling cycle that limits the ability to monitor changes that for individual stops might be small, although they would contribute to an overall rise. 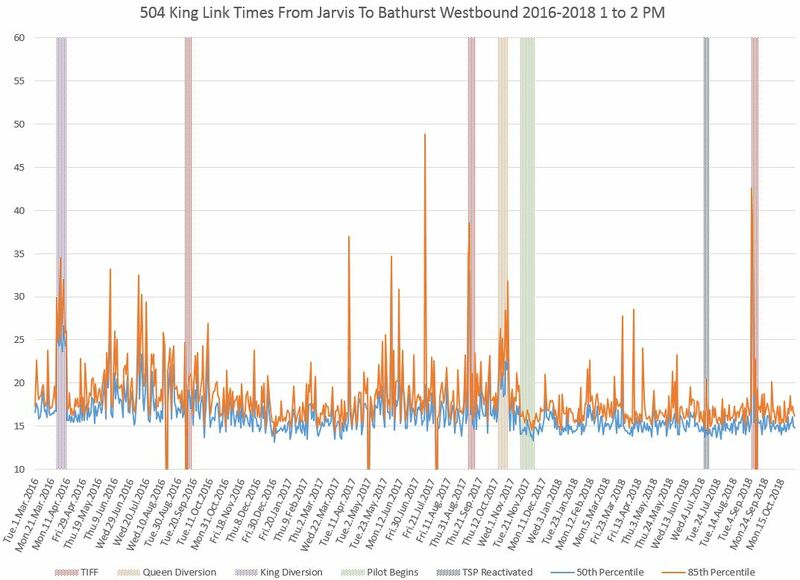 A related issue would be whether longer dwells at, say, Yonge westbound could contribute to more missed greens at Bay where there is no signal priority for transit. Or to put it another way, has the amount of “double stopping” gone up because streetcars lose the “green wave”? Something to look at when there is more data to work with. 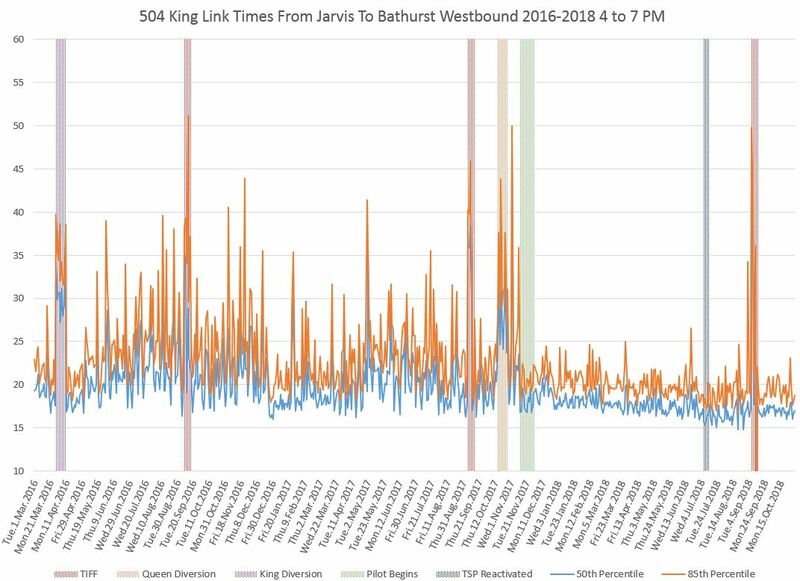 Though transit on King is certainly FAR more regular and reliable now and definitely far faster, there are certainly delays (perhaps more perceived than actual) when cars are running close together and the trailing one sits at the ‘wrong’ side of traffic lights while the leader loads/unloads at the far-side stop. Passengers waiting to alight from the second car undoubtedly see this delay as ‘long’. In the ‘old days’ if two streetcars were back-to-back the operators usually opened the doors of both. No real solution to this but perception is often more ‘believable’ than facts! I have experienced operators trying to manage this themselves. They have a sense of how long it will take to drive to the next intersection and if they see the next light has just turned red they hold at a stop for an extra 15 or 20 seconds so they know they will get a green light and sail through to the next far-side stop. This doesn’t work at University where it is all out of sync with the signals at the intersections to the east and west. This whole process also gets derailed when someone hits the button on the outside right as the doors close, causing them to slowly reopen and the whole cycle to start over again. That feature simply needs to be deactivated if they are not ever going to operate the vehicle by only opening a doors when someone presses the button. Steve: Since the onset of cold weather, I have noticed some operators leaving the buttons active but the doors closed unless someone presses the button to request this. I rode a Kingston Rd. tripper from east of Main St. to Church St. early yesterday evening. The police were doing a crackdown on drivers who were using King St. as a through route, east of Church. Global News had a van and camera there to catch the action. More seriously, I saw big crowds at eastbound stops at Sumach and Parliament; however the next two eastbound cars I saw were both bound for Distillery. The third one was heading for Broadview station, but it was already at a full standing load, so it would be an annoying squeeze for all those who presumably got off a Distillery car because they wanted Broadview. One thing I didn’t see in your analysis was how well the 504A and B variants are alternating. My experience is, not that well. Of course, if you’re waiting in the common section for a specific one, then the other one will show up first, and probably second. I’ve overheard conversations aboard the cars along the lines of “I hate the 504A/504B. It’s always the wrong one”. That’s especially bad in rush hour, where a couple of Dufferin or Distillery cars will leave a big crowd waiting for the next “through” car. It would be good to see some concrete tracking data on this. 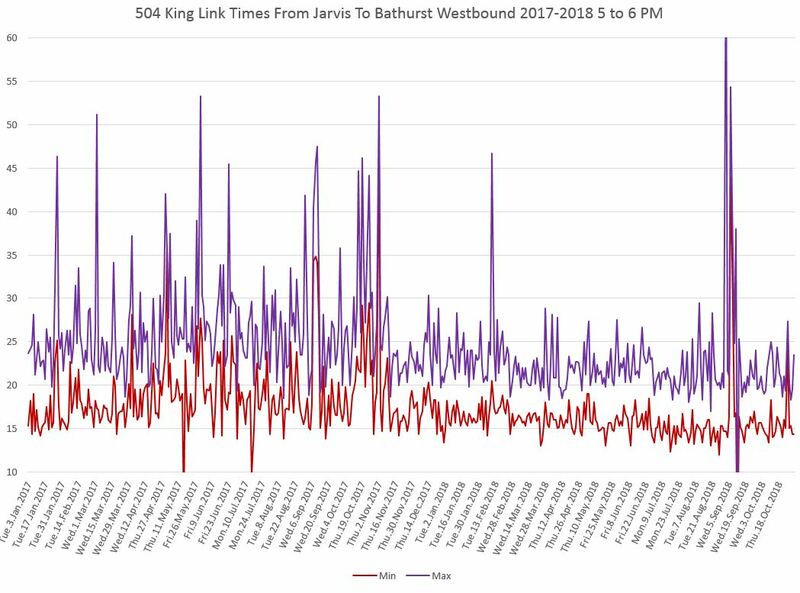 Finally, CLRV 4004 was signed up 504 BROADVIEW STATION, and tracking shows that it put in four or five Dufferin-Broadview runs last night, so yes, CLRVs still find themselves on the King route. Steve: I’m working on an article about headway reliability, and the operation (or not) of the “blended” service is something I want to tackle. That said, the Cherry and King cars didn’t blend well when they were separate routes. The problem today is that with half of the 504 service turning at Dufferin and Sumach, the service beyond can be very spotty. A fairly common situation is to have pairs of cars travel through the central section of the route because they leave the merge points together. This is another example of TTC’s laissez-faire approach to line management. At minimum they needed to extend the loading areas at Yonge, University, and Spadina (to prevent queuing westbound 503/504 cars from blocking 510C cars) from the very start. I’m not surprised they haven’t because that’s the way the TTC rolls. This is a new pet peeve of mine! Andy Byford’s video had all the hoopla about the buttons and they’re never used. It’s not the most comfortable experience to have all doors opening when the temperature dips or rises and it’s especially annoying when there’s only 1 person boarding. Steve: As I said in a previous reply, I am regularly seeing (and boarding) cars where the doors only open if you push the button. That message seems to be getting through to staff. As for stops at Yonge, University and Spadina, let me tell you a story about how the design for King evolved. Originally, there were to be mini transit “malls” at these locations with the blocks from Victoria to Yonge, York to University, and either the west or east side of the Spadina intersection (that was never really settled) completely closed to traffic except streetcars and pedestrians. This would have provided a large waiting and loading zone at these busy stops. The idea was dropped between the second and third round of consultations. I think that had these been retained, a lot of the problem with through traffic would disappear because a through route would simply not be possible/legal for anyone except a transit vehicle (and maybe cyclists). This is an example of how a design compromise undermines the workability of the scheme as a whole. On blending, a stop history feature has been added to TransSee where you can see the all the vehicles that has serviced a stop for a day. Looking at an example (It takes a while to load. If you get a Gateway Time, refresh and it should work.) you can see about half the time the next vehicle will be going to the same destination and groups of three are common. It hasn’t been the case for me. In the last month or so I can only remember one operator not instinctively opening all doors at all stops. I hope the memo gets out. With regards to the pilot, other than the reactivation of the TSP and TTC’s 504 reorganization, have there been any adjustments whatsoever during the last months? There was a lot of talk about how they’d change things as needed during the pilot but I don’t see much change other than the absence of enforcement since the start. Steve: In the last month, no. In Part II of my October update I will include a history of scheduled headway changes on 504/514. There’s no doubt surface transit priority can work wonders, and for Caronto, this is a pretty big step, albeit only in the core. 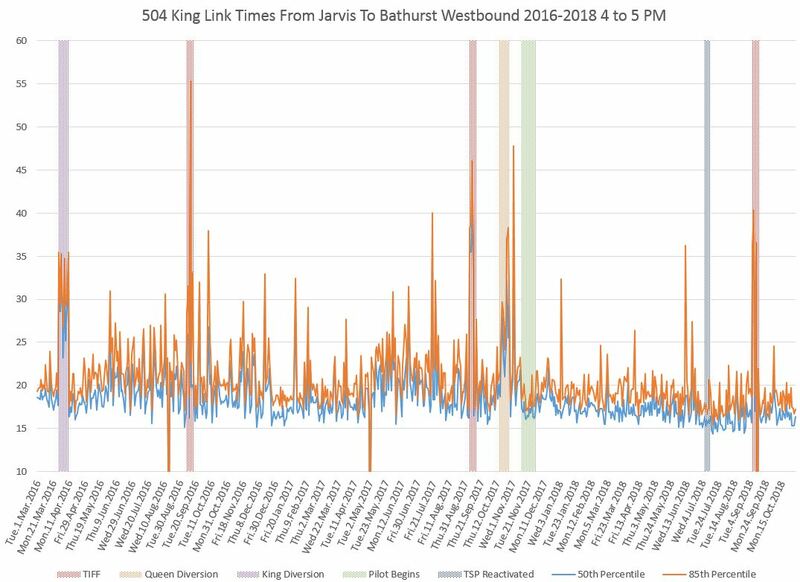 But with all the east-west travel demand of Queen, King, lakefront, Gardiner, Lakeshore – surely this is where we should be thinking about robust transit ie. yes, a subway? Or something better on-surface and sub-regional from Parkdale or pinch point at the base of High Park to the core, with just a few few stops? In current planning terms, it might be called “Relief West” – and there’s been some sets of plans going back a long time to improve the transit beyond the surface and narrow main/long roads of King/Queen. However, the F*s cast a long shadow – the only places for subways in Caronto are in sprawl, and if they bleed the system, too bad, that’s what elites are for, right? So let’s hope that maybe we’ll get some change away from suburban subway squanderings to have them built more appropriately, and no, I’m not happy with the route of the Relief stubway nor its extent. Surface priority should be a focus until we can get the planning better. At around 2:10pm this afternoon I checked in on the 504 route and from what I could see, 17/26 Flexity streetcars out there were clustered between Bay and Sherbourne. Of the remaining 9, 4 were between Sumach and Broadview and 5 were between Howard Park and Strachan. Santa is bringing bad transit to a neighbourhood near you soon!